Father Gutierrez was helping to launch a book, “Poor for the Poor: The Mission of the Church,” edited by Cardinal Gerhard Mueller, who directs the Vatican’s Congregation for the Doctrine of the Faith. Two of the book’s chapters were written by Father Gutierrez, and its introduction was written by Pope Francis. 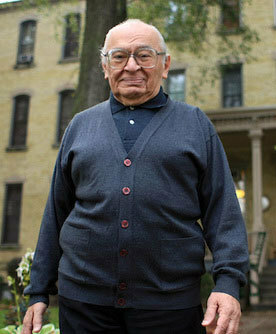 A member of the Notre Dame faculty for the last 13 years, the 85-year-old Father Gutierrez is widely acclaimed as the “godfather” of liberation theology and is the author of the movement’s foundational text, “A Theology of Liberation,” published in 1971. The movement launched by his work grew rapidly in a Latin America plagued by the military dictatorships of the 1960s and 1970s and became one of the most influential in contemporary theology by calling attention to the Church’s vocation to resist the oppression of the poor. Later, in 1984 and 1986, the congregation issued official disapprovals of certain aspects of liberation theology. Among the congregation’s misgivings were the “insufficiently critical” use it made of traditionally Marxist notions of history and social analysis, and the manner in which its emphasis on institutional evils seemed to obviate a serious consideration of individual sin. Ratzinger and his congregation saw to it that Gutierrez spent much of the 1990s writing, rewriting, revising and clarifying theological arguments. “I can’t think of anyone whose witness has been more consistent, or influence more fundamental, among any living theologians,” said John C. Cavadini, director of Notre Dame’s Institute for Church Life, who chaired the theology department when Father Gutierrez came to Notre Dame in 2001. Originally published by Michael O. Garvey at news.nd.edu on February 28, 2014.